The DASH diet is a dietary intervention for the sake of reducing hypertension. Hypertension refers to an excessively high blood pressure and is one of the most common problems among individuals in the English-speaking world. Hypertension can cause a huge variety of incredibly severe and life-threatening illnesses such as cardiovascular disease, stroke, aneurisms, hemorrhages and blood clots. This condition is easily brought about by an excessive dietary intake of various foodstuffs, including salt. We consider someone to be hypertensive if they are above 140/90mmhg . DASH is a diet promoted by the US National institute of health, aimed at reducing blood pressure and returning individuals to healthy ranges. The diet focuses on increasing the intake of fruits, veggies, whole grains and low-fat dairy products, as well as promoting the intake of healthy protein sources (such as white meat and fish), legumes and nuts/seeds. This diet also has some positive effects for a variety of secondary goals such as weight loss, general wellbeing and athletic performance. The DASH diet works . The important question is what do you want it to work for? Many people approach this diet with the primary goal of losing weight, which is both ill-advised and misguided. The DASH diet needs to be viewed and evaluated based on the actual goals towards which it was devised. Judging it as a weight loss diet is contradictory to the original goal of the diet and even the original study (highlighted in ) stipulates that it is intended to improve health and reduce markers of hypertension eucalorically – or, simply put, it is meant to improve health without necessarily reducing bodyfat. Individuals with incredibly low bodyfat can also suffer hypertension and the two only correlate in the cases of individuals who are overweight or obese. Obesity causes hypertension, but not all those who suffer hypertension are obese . Whilst the DASH diet can be adapted to improve weight loss and support an effective athletic performance, this is not a revolutionary statement. Foods which tend to correlate with hypertension also tend to be calorie-dense and many of them (though not all) are nutrient-sparse. For example, suggesting that a calorie-controlled DASH diet will reduce bodyfat is obvious because calorie-control is the mechanism by which we can affect body fat . The increased consumption of fruits and vegetables, lean protein sources, nutrient-dense foods and the reduction of poor-quality fats are well-documented ways to approach dieting and the DASH diet simply reinforces existing ideas about the effectiveness of this diet. There are some senses in which the DASH is useful as a template but suffers from the same problems that any template will have: a strong case can be made for the idea that the DASH diet is overly-restrictive. The removal of fats does not necessarily imply improvements in health or hypertension – the concerns of blood lipids and blood pressure can be ameliorated by the consumption of high-quality fats . Restricting dietary fat intake does not seem to combat the main reasons that individuals suffer from hypertension – whilst it is understandable that a diet aimed at the general population would be general in its prescriptions, it would be more effective to highlight the differences between, say, poly-saturated and monounsaturated fats. The former will exacerbate hypertension whereas the latter will lessen it. The main criticism made of DASH is that it is a difficult diet to keep up with, or simply that it is too time-costly. This seems to be a misgiving and provides no real criticism of the diet: it may well be a more time-consuming diet than the regular American diet, but this does not mean it is ineffective or lacking in any way. This criticism seems inherently juvenile: diets are not always easy to follow when we are more concerned with taste and mouthfeel than with health and performance. For example, this criticism centers around the fact that individuals were required to buy produce and prepare their own meals, as opposed to buying ready-to-eat foods or other processed, pre-packaged foods. This, however, is the specified benefit of the diet: the reduction in processed, ready-to-eat foods is directly responsible for the increased nutrient-density of the diet and a failure of individual willpower is not a reflection on the diet itself. As with many other diets, DASH can be formulated in a way that removes unnecessary restriction and approaches what Alan Aragon calls a “scientific diet” – a diet that optimises the influence and quality of each macronutrient group, as well as retaining calorie balance and sufficient nutrient-density. For the DASH diet, this simply involves a more measured approach to the restriction and inclusion of fat sources. 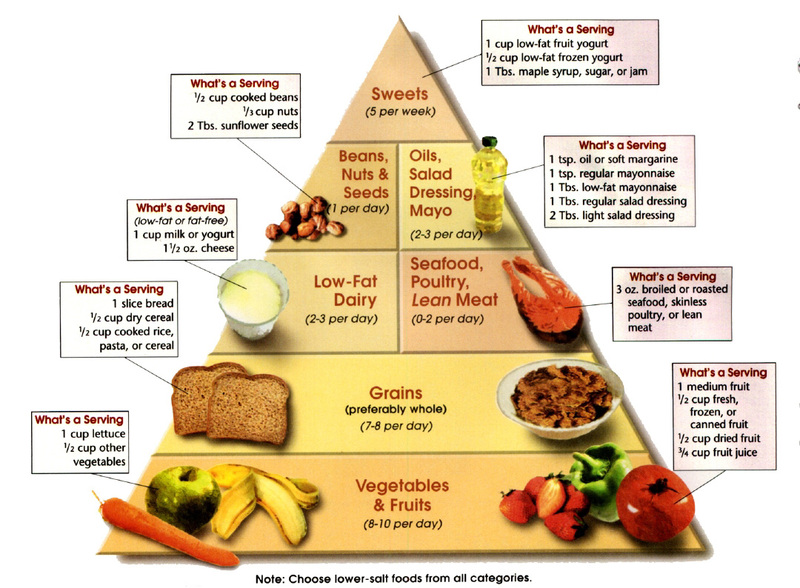 Beginning with the standard DASH “pyramid” of foods (It’s more of a triangle, really) , we need only to stipulate that high-quality fats (primarily those from vegetables, fatty fish and quality oils) should be included. Additionally, the inclusion of some processed, partial grains may be effective when we consider the need for B12 in a diet. B12 is a notoriously low-bioavailability nutrient and is difficult to achieve through the DASH diet – the reductions in red meat and processed grains contribute to the fact that most of us are deficient in this nutrient. Whilst these two foodstuffs have a poor reputation, the most bioavailable form of B12 is found in fortified cereals , whereas supplementary and vegetable sources are often low in bioavailability . The DASH diet has some of the strongest evidence to support its initial claims of any diet that we have looked at – it is backed by studies with large sample sizes and effective cause-effect validity. The diet bears all the hallmarks of effective nutrition – a focus on high-quality food sources, nutrient-dense produce and low sodium intake. Whilst not originally designed for the sake of weight loss, it can have great effects in this area. With a few small tweaks, this diet can present huge effects in the areas of weight loss, athletic performance, blood sugar regulation and body composition. It is a traditionally healthy diet, backed by science and criticized only from the perspective of individuals who can’t adhere to it. In this sense, it is the typical “healthy” diet and, with the tweaks mentioned above, can be incredibly valuable. Moore et al (2001): ‘The DASH diet for hypertension’, New York: Simon and Schuster. Carmel, R (2008): ‘Efficacy and safety of fortification and supplementation with Vitamin B12: biochemical and physiological effects’. International nutrition foundation, 29 (Supp. 1).